Akihito (明仁, Japanese: [akiçito]; English pronunciation (help·info); born 23 December 1933) is the current Emperor of Japan. He succeeded to the Chrysanthemum Throne upon the death of his father Emperor Shōwa (Hirohito) on 7 January 1989. According to Japan's traditional order of succession, he is the 125th member of the world's oldest reigning dynasty. The Japanese government announced in December 2017 that Akihito would abdicate on 30 April 2019 due to his age and declining health. In Japan, the Emperor is never referred to by his given name, but rather is referred to as "His Majesty the Emperor" (天皇陛下, Tennō Heika) which may be shortened to His Majesty (陛下, Heika). In writing, the Emperor is also referred to formally as "The Reigning Emperor" (今上天皇, Kinjō Tennō). The Era of Akihito's reign bears the name "Heisei" (平成), and according to custom he will be renamed Emperor Heisei (平成天皇, Heisei Tennō, see "posthumous name") by order of the Cabinet after his death. At the same time, the name of the next era under his successor will be established. If the Emperor abdicates as planned, he will receive the title of Jōkō (上皇), an abbreviation of Daijō Tennō (太上天皇, Retired Emperor), and the new era, "Reiwa" (令和), will be established. Accordingly, the Imperial Household Agency designated the official translation of Jōkō as "Emperor Emeritus". 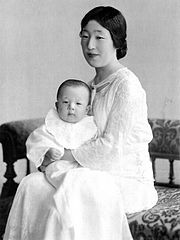 Akihito was born in the Tokyo Imperial Palace, Tokyo, Japan, and is the elder son and the fifth child of the Emperor Shōwa (Hirohito) and Empress Kōjun (Nagako). Titled Prince Tsugu (継宮, Tsugu-no-miya) as a child, he was raised and educated by his private tutors and then attended the elementary and secondary departments of the Peers' School (Gakushūin) from 1940 to 1952. Unlike his predecessors in the Imperial family, he did not receive a commission as an army officer, at the request of his father, Hirohito. Crown Prince Akihito and Crown Princess Michiko made official visits to thirty-seven countries. 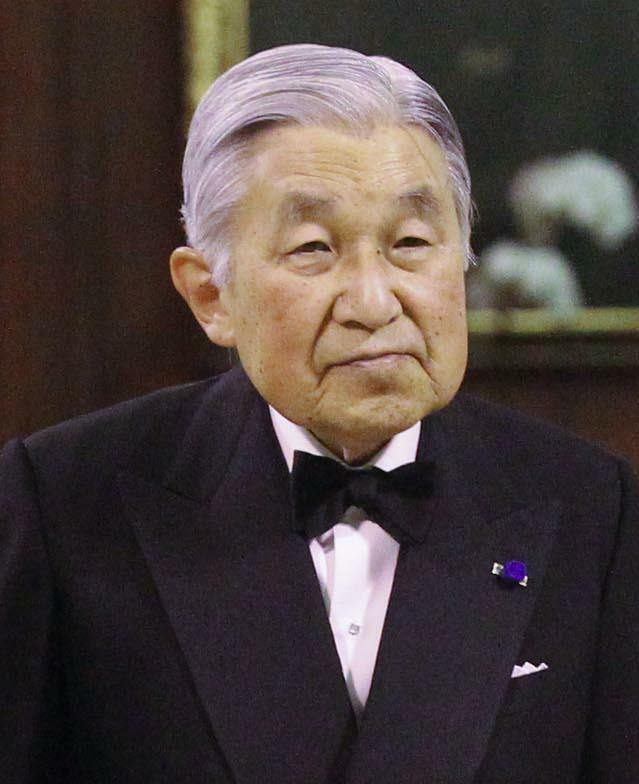 As an Imperial Prince, Akihito compared the role of Japanese royalty to that of a robot. He expressed the desire to help bring the Imperial family closer to the people of Japan. Upon the death of Emperor Hirohito on 7 January 1989, Akihito acceded to the throne, with the enthronement ceremony taking place on 12 November 1990. In 1998, during a state visit to the United Kingdom, he was invested with the UK Order of the Garter. Emperor Akihito underwent surgery for prostate cancer on 14 January 2003. In response to the 2011 Tōhoku earthquake and tsunami and the Fukushima I nuclear crisis, the Emperor made a historic televised appearance urging his people not to give up hope and to help each other. The Emperor and Empress also made a visit on Wednesday, 30 March 2011 to a temporary shelter housing refugees of the disaster, in order to inspire hope in the people. This kind of event is also extremely rare, though in line with the Emperor's attempts to bring the Imperial family closer to the people. Later in 2011 he was admitted to hospital suffering from pneumonia. In February 2012, it was announced that the Emperor would be having a coronary examination; he underwent successful heart bypass surgery on 18 February 2012. In August 1957, he met Michiko Shōda on a tennis court at Karuizawa near Nagano. The Imperial Household Council formally approved the engagement of the Crown Prince to Michiko Shōda on 27 November 1958. At that time, the media presented their encounter as a real "fairy tale", or the "romance of the tennis court". It was the first time a commoner had married into the Imperial Family, breaking more than 2,600 years of tradition. The engagement ceremony took place on 14 January 1959, and the marriage on 10 April 1959. The Emperor and Empress had three children: sons Naruhito, Crown Prince of Japan (born 23 February 1960) and Fumihito, Prince Akishino (born 30 November 1965) and daughter Mrs. Sayako Kuroda (born 18 April 1969). According to the Constitution of Japan, Akihito is "the symbol of the State and of the unity of the people." Unlike other constitutional monarchs, his function is defined as entirely representative and ceremonial in nature, without even a nominal role in government. He is limited to acting in matters of state as delineated in the Constitution, and even in those matters, he is bound by the requirements of the Constitution and the binding advice of the Cabinet. For instance, while he formally appoints the Prime Minister, he is required to appoint the person designated by the Diet, without the option to decline appointment. Despite being strictly constrained by his constitutional position, he also issued several wide-ranging statements of remorse to Asian countries, for their suffering under Japanese occupation, beginning with an expression of remorse to China made in April 1989, three months after the death of his father, Hirohito. In June 2005, the Emperor visited the island of Saipan (part of the Northern Mariana Islands, a U.S. territory), the site of a battle in World War II from 15 June to 9 July 1944 (known as the Battle of Saipan). Accompanied by Empress Michiko, he offered prayers and flowers at several memorials, honoring not only the Japanese who died, but also American soldiers, Korean labourers, and local islanders. It was the first trip by a Japanese monarch to a World War II battlefield abroad. The Saipan journey was received with high praise by the Japanese people, as were the Emperor's visits to war memorials in Tokyo, Hiroshima, Nagasaki and Okinawa in 1995. Since succeeding to the throne, Akihito has made an effort to bring the Imperial family closer to the Japanese people. He and Michiko have made official visits to eighteen countries and to all forty-seven Prefectures of Japan. Emperor Akihito, at Chōwaden Reception Hall, giving a New Year's address to the Japanese people in 2010. On 13 July 2016, national broadcaster NHK reported that the Emperor intended to abdicate in favor of his eldest son Crown Prince Naruhito within a few years, citing his age. An abdication within the Imperial Family has not occurred since Emperor Kōkaku in 1817. However, senior officials within the Imperial Household Agency denied that there was any official plan for the monarch to abdicate. Abdication by the Emperor required an amendment to the Imperial Household Law, which had no provisions for such a move. On 8 August 2016, the Emperor gave a rare televised address, where he emphasized his advanced age and declining health; this address was interpreted as an implication of his intention to abdicate. On 19 May 2017, the bill that would allow Akihito to abdicate was issued by the Japanese government's cabinet. On 8 June 2017, the National Diet passed a one-off bill allowing Akihito to abdicate, and for the government to begin arranging the process of handing over the position to Crown Prince Naruhito. The Japanese government announced in December 2017 that Akihito would abdicate on 30 April 2019. Scholia has an author profile for Akihito. In extension of his father's interest in marine biology, the Emperor is a published ichthyological researcher, and has specialized in studies within the taxonomy of the family Gobiidae. He has written papers for scholarly journals such as Gene and the Japanese Journal of Ichthyology. He has also written papers about the history of science during the Edo and Meiji eras, which were published in Science and Nature. In 2005, a newly described goby was named Exyrias akihito in his honour, and in 2007 a genus Akihito of gobies native to Pacific islands also received his name. If the abdication goes as expected, Akihito's title will be "Jōkō" or Emperor Emeritus. FR Yugoslavia split into Serbia and Montenegro. As of 2006 this order is аbolished. Zaire is now the Democratic Republic of the Congo. Belgium), they did not include the Emperor and are not included in this table. Indonesia "To foster friendly relations at the invitation of Thailand, Malaysia and Indonesia"
China "To foster friendly relations at the invitation of China"
Belgium "To attend the funeral ceremony of King Baudouin of Belgium"
United States "To foster friendly relations at the invitation of the United States"
Spain "To foster friendly relations at the invitation of France and Spain"
Argentina "To foster friendly relations at the invitation of Brazil and Argentina"
Denmark "To foster friendly relations at the invitation of the United Kingdom and Denmark"
Sweden "To foster friendly relations at the invitation of the Netherlands and Sweden"
Hungary "To foster friendly relations at the invitation of Czech Republic, Poland and Hungary"
Norway "To foster friendly relations at the invitation of Norway"
United States "To pay tribute to those who died in the war and to pray for world peace in the 60th year after the end of the war"
Thailand "To celebrate the 40th anniversary of the establishment of diplomatic relations at the invitation of Singapore and to attend celebrations for the 60th anniversary of the accession to the throne of King Bhumibol Adulyadej of Thailand"
United Kingdom "To mark presence as a honorary member of the Linnean Society on the 300th birth anniversary of Carl von Linné at the invitation of Sweden and the United Kingdom and to foster friendly relations at the invitation of Estonia, Latvia and Lithuania"
United States "To foster friendly relations at the invitation of Canada, and to celebrate the occasion of the 50th anniversary of the Crown Prince Akihito Scholarship Foundation (Visit to Hawaii)"
United Kingdom "To attend a luncheon in commemoration of the Diamond Jubilee of Queen Elizabeth II at the invitation of Queen Elizabeth II"
India "To foster friendly relations at the invitation of India"
Palau "To pay tribute to those who died in the war and to foster international goodwill in the 70th year after the end of the war"
Philippines "To foster friendly relations on the occasion of the 60th anniversary of the normalization of diplomatic relations at the invitation of the Philippines"
Vietnam "To foster friendly relations at the invitation of Vietnam"
^ Noboru Takeshita was prime minister of Japan from 6 November 1987 to 3 June 1989, so he was the first prime minister of Japan during Emperor Akihito's reign. ^ a b Enjoji, Kaori (1 December 2017). "Japan Emperor Akihito to abdicate on April 30, 2019". CNN. Tokyo. Retrieved 1 December 2017. ^ "National Day of Japan to be celebrated". Embassy of Japan in Pakistan. 7 December 2007. Archived from the original on 2 February 2008. Retrieved 28 December 2007. ^ "Government panel outlines proposals on Emperor's abdication, titles". The Japan Times Online. 14 April 2017. Retrieved 9 June 2017. ^ "Japan may announce new Imperial era name in summer 2018". The Japan Times. 19 May 2017. Archived from the original on 24 July 2017. Retrieved 31 May 2017. ^ a b c d e f "Their Majesties the Emperor and Empress". Imperial Household Agency. 2002. Archived from the original on 1 December 2007. Retrieved 28 December 2007. ^ "Those Apprentice Kings and Queens Who May – One Day – Ascend a Throne," The New York Times. 14 November 1971. ^ a b Varley, H. Paul. (1980). Jinnō Shōtōki, p. 44. ^ "Press Conference on the Occasion of His Majesty's Birthday". Imperial Household Agency. Archived from the original on 25 May 2008. Retrieved 7 July 2008. ^ Chotiner, Isaac (8 August 2016). "What Does the Japanese Emperor Do? And will Japan let him stop doing it?". Slate. ^ "Akihito has successful cancer operation". BBC News. BBC. 18 January 2003. Retrieved 28 December 2007. ^ "Message from His Majesty The Emperor". The Imperial Household Agency. 16 March 2011. Retrieved 9 August 2016. ^ "Japan's Emperor Akihito leaves Tokyo hospital". BBC News. 24 November 2011. Retrieved 24 January 2012. ^ "Emperor Akihito to have coronary examination". Mainichi Daily News. 1 February 2012. Archived from the original on 14 July 2012. ^ "The Girl from Outside". Time. 23 March 1959. Retrieved 22 November 2018. ^ "The wedding that broke centuries of tradition". BBC News. 1 September 2017. Retrieved 1 September 2017. ^ Brooke, James (28 June 2005). "Visiting Saipan, Japan's Emperor Honors Dead". New York Times. Retrieved 9 August 2013. ^ Yoshida, Reiji (27 March 2007). "Life in the cloudy Imperial fishbowl". Japan Times. Retrieved 28 May 2017. ^ "The Future of Japan's Dwindling Imperial Family". Retrieved 26 July 2014. ^ Akihito (October 1992). "Early cultivators of science in Japan". Science. 258 (5082): 578–80. doi:10.1126/science.1411568. PMID 1411568. ^ His Majesty The Emperor of Japan (July 2007). "Linnaeus and taxonomy in Japan". Nature. 448 (7150): 139–140. doi:10.1038/448139a. PMID 17632886. ^ "Bundeskanzler Anfragebeantwortung" [Reply to a parliamentary question about the Decoration of Honour] (PDF) (in German). p. 1298. Retrieved 27 January 2017. ^ Persondetaljer – Hans Kejserlige Højhed Akihito Archived 29 May 2012 at the Wayback Machine. borger.dk. ^ "Akihito". Bearers of decorations. president. Retrieved 18 January 2011. ^ Presidency, table Archived 10 May 2013 at the Wayback Machine of recipients of the Order of the Three Stars since 2004. ^ "Cidadãos Estrangeiros Agraciados com Ordens Portuguesas" (in Portuguese). presidencia.pt. Retrieved 6 January 2011. ^ "List of Overseas visits by the Emperor and Empress (1989–1998)". The Imperial Household Agency. Retrieved 23 June 2018. ^ "List of Overseas visits by the Emperor and Empress (1999–2008)". The Imperial Household Agency. Retrieved 23 June 2018. ^ "List of Overseas visits by the Emperor and Empress (2009 or later)". The Imperial Household Agency. Retrieved 23 June 2018. ^ a b Bix, Herbert P. (2001). Hirohito and the making of modern Japan (Book) (1st Perennial ed.). New York: Perennial. pp. 22–23. ISBN 978-0060931308. ^ a b Keene, Donald. Emperor Of Japan: Meiji And His World, 1852–1912. Columbia University Press (2005). ISBN 0-231-12341-8. pp. 320–321. ^ a b "The Accession of Empress Taisho (1)". Metadata database of Japanese old photographs in Bakumatsu-Meiji Period. Nagasaki University. Retrieved 4 January 2019. ^ "Genealogy of the Emperors of Japan" (PDF). Imperial Household Agency. Archived from the original (PDF) on 30 March 2011. Retrieved 30 March 2011.